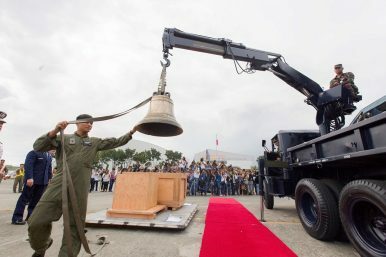 One of the Balangiga Bells is removed from its crate before a ceremony honoring the bells' return at Villamor Air Base, Manila‎. The return of three church bells, longtime U.S. trophies of war, is a unique opportunity for U.S.-Philippine relations. The recent repatriation by the United States of the Balangiga bells to the Philippines serves as a catalyst to reinvigorate a tarnished U.S.-Philippines relationship. While the timing carries a bit of romantic irony, with an anti-U.S. Philippine president at the driver’s seat, the bells’ return nonetheless came at an opportune and necessary moment for both parties concerned. During the Philippine-American war (1899-1902), the tolling of the Balangiga church bells was used as a signal for Philippine insurgents to attack American troops of the 9th infantry regiment, stationed close to the church. Forty-eight U.S. servicemen were killed. In retaliation, General Jacob Smith ordered his men to “kill anybody over 10” and turn the island of Samar into a “howling wilderness”; the U.S. revenge ultimately claimed 2,500 Filipino lives. Coinciding with the defeat of the Philippines, the bells, three in total, were taken as war mementos. For more than a century the bells have been on display at U.S. bases in Wyoming and South Korea. Their return to the Philippines came under Philippine President Rodrigo Duterte, who has used historical atrocities and present U.S. criticisms of the Philippines as a central theme of his rhetoric to foment his domestic rabble-rousing and an eventual shift of the country’s foreign policy. While the Balangiga bells and the Philippine-American war as a whole provide a revolutionary backdrop for Duterte’s anti-Western and anti-U.S. narrative, his disdain for the United States goes far beyond history books. While Duterte was still mayor of the southern city of Davao, an American citizen who was charged with possession of explosives following an explosion in the hotel where he was staying, was allegedly spirited out of the country by FBI agents without facing Philippine courts. Strangely, the incident coincided even as the Philippines was made a major non-NATO ally by then-U.S. President George W. Bush following his government’s global war on terror. Upon assuming the presidency, Duterte has been criticized by the United States for his administration’s war on drugs. The U.S. State Department even blocked the sale of U.S.-made weapons to the Philippines’ police forces. But more broadly, there’s the question of American reliability as an ally. That was highlighted during Duterte’s meeting with U.S. Ambassador to the Philippines Sung Kim, where the brash talking president directly asked the ambassador why the United States didn’t confront China militarily while it was still in the midst of land reclamation in the disputed South China Sea. To Duterte’s chagrin, all these factors suggest that history has repeated itself. While the Southeast Asian archipelago is one of the United States’ historical allies, as highlighted by the long-enduring 1951 Mutual Defense Treaty, the Philippines is nonetheless still being treated as an expandable friend, which is further exacerbated by colonial undertones. While the bells’ repatriation will not turn back time on the bloody history associated with them, their return nonetheless presents a moment of opportunity for the United States to assuage Duterte that it can still rely on Washington to be a trusted strategic ally. Especially now that China is getting stronger and more belligerent by the day in the South China Sea, the Philippines and the United States share a common interest to reign in China’s ambitions. If the U.S. intends to remain significant in this part of the world, the Philippines would undoubtedly be an easy ally to tap into, owing to America’s colonial influence in the country. However, times have changed. Now more than ever, with a rabidly anti-U.S. Duterte in firm control of the Philippines, the United States needs to show that it intends to to be an equal partner and that it has shunned the trappings of a former colonial master. Melchizedek Maquiso is originally from the Philippines and is a graduate of the Master of Public Policy program at the Johnson-Shoyama Graduate School of Public Policy, University of Saskatchewan, Canada.